Incoterms are the official International Chamber of Commerce (ICC) rules for the explanation of trade terms. Incoterms are adhered to by all major trading nations of the world, and it is the authoritative text for determining how costs and risks are allocated to the parties conducting international transactions. Incoterms facilitate the conduct of international business by defining the responsibilities of the involved participants. This is the second article in our series investigating the basic meaning of all 11 Incoterms. (You can read here about our first Incoterm, FCA.) The Incoterm we’re discussing today is Delivered At Place (named place of destination), also known as DAP. 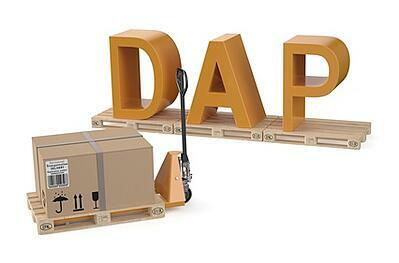 What Does the Delivered At Place (DAP) Trade Term Mean? When Can DAP Be Used? DAP can be used for any mode of transport—air, courier, truck, rail, vessel or multi-modal shipments—or when there are multiple modes of transport. In Incoterms 2010, DAP replaced the terms DAF, DES and DDU. The seller bears all risks involved in bringing the goods to the named place and typically insures the shipment. The trade term should be named in the sales contract. For example, a U.S. exporter and their European customer might agree to, "Incoterms 2010 DAP Rotterdam, the Netherlands." There are myriad resources available to help you further understand the trade term DAP and all Incoterms. We have a robust archive of Incoterms-related articles on our International Trade Blog.